The children’s minister at the church had already told us that he couldn’t come to Sunday School without one of us there. In a phone call several months prior, she informed me that my husband or I would have to accompany my little boy if we wanted him to attend. Since Eric taught Sunday School, that left the job to me. During the summertime, a friend’s daughter volunteered to step into my place. She worked beautifully with Travis and we were blessed and relieved to continue our normal Sunday routine. But now she was back at college for the fall, and I was going to have to step in and attend kids’ Sunday School so that my child would be allowed in. Months later I was asked by church staff if this was offensive. Would a parent of a special needs child feel offended at being asked to attend Sunday school with their child as a condition of that child being allowed to attend? Without hesitation I replied “YES.” An emphatic yes. Here’s why: Parents of disabled kids struggle more on a daily basis than parents of non-special needs kids. I feel qualified to make such a bold statement because I am the parent of both. 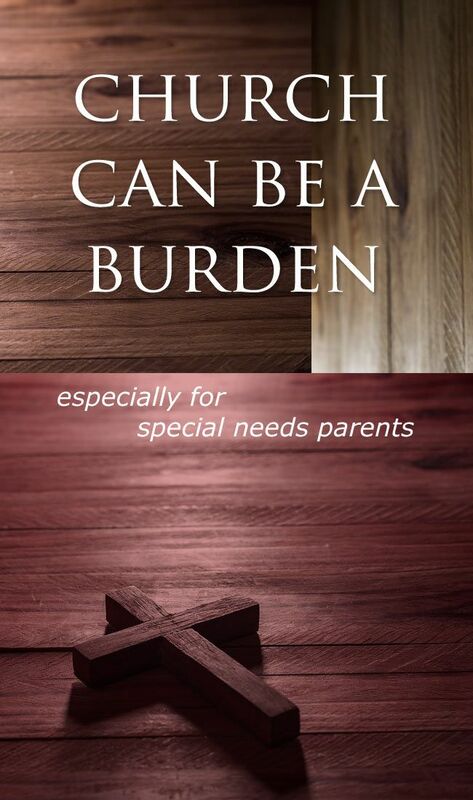 Dealing with special needs is extremely hard, stressful and challenging. Making it to church on a Sunday morning is exponentially more difficult than what other families go through. The stress level of mothers of special needs kids has been compared to that of combat soldiers. 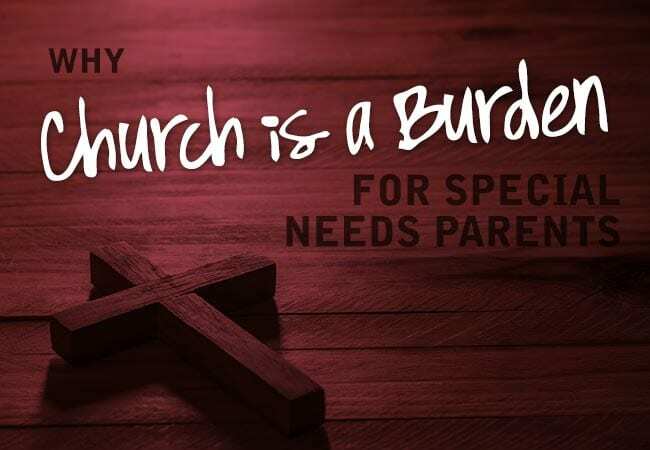 Church is a burden for special needs parents. They NEED a break. Church on Sunday morning needs to be, if nothing else, a respite. A time when they can have an hour—just one hour!—to fellowship with other adults; to relax and drink a cup of coffee; to focus on their own spiritual walk; to get away from the constant state of alertness that accompanies raising a special needs child. I was prepared to go to my son’s Sunday School class, but I didn’t want to go. My emotions were running high. I was sad and stressed and needed support that I wasn’t getting. Tears welled up in my eyes because in his words, in his simple statement, I felt the presence of the Lord Jesus in that room as clearly as I’ve ever felt anything. My son’s teacher was awash in the love of the Holy Spirit and it came through in his face, his words, his demeanor, his attitude. It wasn’t going to be a problem. You see, Travis was treated like a problem since age 5. Every time we had a new teacher or a new challenge, concerned individuals would approach me (the mother—why is it always the mother?) wanting to know how to handle the inevitable problems that would follow in Travis’ wake. I have to admit that even I approached my own son this way. I didn’t in the beginning, but experience made me shell-shocked and gun-shy. I assumed the best way to ward off bad experiences was to come in with guns loaded, ready to shoot down enemies and arguments, armed with an answer for every possible scenario. Carrying all that ammunition took its toll on me. Combat soldier indeed. I learned to see my own son as a problem. But our new Sunday School teacher never viewed him that way. He didn’t see Travis as a problem. He saw him as a child. As we stood there, I couldn’t help noticing the love and warmth all over the man’s face, not only for my little boy, but for us, his parents. I was shaken to the core. It was OK for me to expect to be loved. This man loved us, he loved our little boy, he loved and trusted God. And it was OK for me to expect that. You see, I’d gone into it before with expectations of being loved. I’d assumed that things would be all right, that there wouldn’t be any glitches that couldn’t be worked through, because I was so assured that the people involved loved my son and my family. But I was mistaken. What I found out was just how conditional love can be. Sure, people loved my family—as long as we fit into their idea of what “lovable” looks like. But Travis at that age just didn’t. So they didn’t love us. And they seemed appalled that we should expect otherwise. I grew to be ashamed of expecting love. I was made to feel that it was something wrong on my part. That I should know better than to expect love and acceptance when my family couldn’t get our act together. The most hurtful part was how everyone wanted my daughter so much. She was a teacher’s dream—her behavior, her intelligence, her talent, her kindness, her sweet attitude. It was as though they could make up for the lack of love for her twin by reminding me of all of Sara’s good qualities. My daughter is wonderful. I already knew that. Of course I was pleased to hear their accolades. But how could praise for her and disdain for my son come from the same mouth? When these two babies had spent every moment since conception, side by side, formed in the same womb at the same time? When they were and are as close as two children could ever be? When every parenting mistake or success I had with them was done simultaneously? How could people not see the hypocrisy in their behavior? I’m several years removed from it now and I wish I could go back to the mother I was and gently lead her away from that atmosphere of condemnation and guilt. She did not deserve such treatment, and yet she was not strong enough at the time to recognize it. She suffered the blame, willingly received the blows on behalf of the little boy she called her own. I allowed others to shame me, to blame me, to point fingers and put me in my place. I allowed them to exclude my son and my family, to judge and to mistreat. I should’ve left much sooner. It was all so very complicated. Instead of sharing my burdens, some church people threw more bundles on my back. They loaded me down with their expectations and condemnation. I buckled under the weight of their judgments and their righteousness, and when I stumbled, they would kick me to goad me back into submission beneath their yoke of rules. It was NOT Christian or Christ-like. But it did not. Praise be to God, it did not. Perhaps you’ve experienced something similar. May I offer a gentle word of encouragement? You are NOT overstepping your boundaries by expecting your child to be loved and accepted in church. 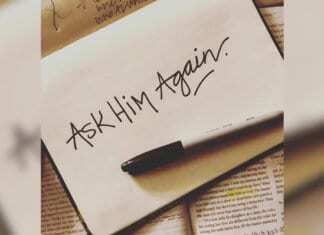 It is NOT too much to ask. If others are heaping more burdens on you than you can bear, it might be time to look for a different fellowship. Or perhaps special needs is not your particular battle in life. But maybe you know a family who deals with the issue. Would you be willing to put aside your preconceptions and welcome them into your life and your church? Would you be willing to love the way my son’s Sunday School teacher did? Would you offer to view such a family as people who deserve love and not as a problem to solve? We really can change for the better. Change happens one child, one family, one smile, one kind word at a time.